Hmm....weren't the Vandals originally a tribe from Europe? Maybe in the future it will be called Craigism. Tom-I looked up Lindsey, per Mike's original post. C. Lindsley would have been right next to Lindsey in the directory (there was only 1 Lindsey-Seattle was not so big) so I think I would have seen C. Lindsley there too. But, I could have missed it. My compliments to Mike Collins, Tom, Copperhead Kid, kiliki, and all other NWHikers.net readers who have contributed to this very interesting and informative thread. This truly is an outstanding work of historical discovery, decipherment, sleuthwork, and interpretation. Historic inscriptions such as this are a rarity in the North Cascades. I personally knew one of the individuals, whose name appears on this rock. Lawrence Denny Lindsley (1878-1975) was the grandson of David Thomas Denny (1832-1903), one of the original founders of Seattle in 1851. Lawrie Lindsley, one of the pioneer miners and photographers of the North Cascades, is known to have worked at the Denny family mine at the head of Gold Creek from 1895 to 1902, at which time he took a number of photographs in this area. These pictures are now preserved in his photo album no. 1, in the Photography Collection at the University of Washington Library. Included among these are views of the cabin (exterior and interior), David Denny (with a long white beard), the mine, Ptarmigan Park, the neighboring mountains, and a mountain goat hunt (reproduced in Northwest Discovery, vol. 1, Oct. 1980, pp. 192-207). I suspect that this series of Gold Creek photographs was taken during the summer of 1899, when David Denny was in charge of construction work on the Snoqualmie Pass wagon road. Among these photographs (p. 197) is a view looking toward Lemah Peak and the northwest, taken from the ridge above Gold Creek --- likely on the same trip during which Rolland Denny and Lawrie Lindsley left their names inscribed on the rock immediately northwest of Four Brothers peak. In his caption for this particular photo, Lawrie wrote: "During the summer when we were mining we climbed this ridge above our cabin when we wanted to take a good look at the big mountains." Thirty years ago, I visited with Lawrie at his home south of 45th Street (immediately west of the University of Washington) and conducted a tape-recorded interview with him in an effort to preserve his reminiscences of early days in the North Cascades. Among his more vivid memories was that of sitting on Denny Hill and watching the Great Seattle Fire of 1889 destroy the historic pioneer town below. To an impressionable young boy of 11 years, it seemed like the end of the world was at hand. Here was an individual who had seen at first hand the Great Seattle fire, who knew old Seattle as it had been prior to 1889, who knew the daughter of Chief Seattle, who witnessed the Alaska-Yukon Gold Rush, and who had explored and photographed extensively in the North Cascades. Lawrie Lindsley not only knew the founders of Seattle, he himself was a member of the Denny family, the premier pioneer family of early Seattle. David Denny owned the Esther Mine and cabin, situated in Ptarmigan Park (southwest of the Four Brothers), at the head of Gold Creek. This mine, first located within 1890-1893, was worked on by David Denny's sons, son-in-law, and grandsons. The rustic but spacious cabin had been built in Ptarmigan Park by Lawrie's father Edward Lindsley "in 1896 when the Esther Mine was at full blast," and contained a modest iron stove that had been hauled in via pack train. By 1897, there was a large steam boiler at the mine that furnished power to drive two steam drills and an ore crusher. The Denny family had a long association with the history of Snoqualmie Pass. During the late 1860s, Arthur Denny (older brother of David) explored the area about Snoqualmie Pass, prospecting for ore and scouting for a potential wagon road over the Cascades. Denny Creek and Denny Mountain honor Arthur's pioneering efforts in this area. During the summer of 1899, David Denny was in charge of construction work on the wagon road across Snoqualmie Pass. An extract from his report for that year appears in: Yvonne Prater, "Snoqualmie Pass" (Seattle, 1981), pp. 39-43. It was probably during this visit that Lawrie Lindsley (with camera in hand) accompanied his grandfather to Snoqualmie Pass, spent some time at work at the Esther Mine, and then joined Rolland Herschel Denny (1851-1939) on an ascent of the ridge connecting the Four Brothers to Chikamin Peak. Four Brothers peak, situated on the ridge southeast of Chikamin Peak, and overlooking both Ptarmigan Park and the Esther Mine, was named for the three Denny brothers and one brother-in-law who occasionally labored at the mine during the summer in the 1890s, doing development and assessment work. These men were three of David Denny's sons (John Denny, Thomas Denny, and Victor Denny), and his son-in-law Edward L. Lindsley (father of Lawrence Denny Lindsley). During September 1917, Lawrie Lindsley attained a brief moment of national fame when he and Dan Devore (Devore Peak and Devore Creek) served as guide, cook, and packer for Mary Roberts Rinehart's pack-train journey to Cascade Pass and Lyman Lake from Lake Chelan. When Mary (a publicity agent for the Great Northern) published an account of the trip the following year, she referred to him as "Silent Lawrie" (because of his taciturnity), and wrote that "He knew every tiniest flower and plant that thrust its head above the leafmold": Gene Faure, "Silent Lawrie in the North Cascades," The Mountaineer, 1964 annual, pp. 84-87. A footnote to North Cascades history --- In 1893 and again in October 1895, a fellow whom the Denny family had known since 1888, and who had been provided with employment and financial loans by the family, went to work at the Esther Mine at the head of Gold Creek. His name was James H. Holden (1855-1918). It was the Denny family who first introduced James Holden to the Railroad Creek area in 1893, and who first hired him to prospect there. In July 1896, while prospecting up Railroad Creek, Holden located what would eventually become the Holden copper mine. Although his prospecting efforts had for years been financed by the Denny family; after his discovery of the Railroad Creek bonanza Holden refused to honor what the Denny family had regarded as a verbally agreed-upon partnership. This incident, and the ensuing lawsuit (which do not cast Holden in the best of light), are detailed in: Nigel B. Adams, "The Holden Mine" (87pp. ; Tacoma, 1981). When I spoke with Lawrie, more than seven decades after this incident had transpired, he still recalled with dismay Holden's less than honorable behavior in the matter. As for the Esther Mine on Gold Creek, Lawrie Denny recalled that: "Grandpa Denny had such high hopes we would strike the real pay streak. He made his last trip up here in Oct. 1899 and never came back again. There are many buried hopes in the tunnels and shafts in the Cascade Range." Lawrie's comment is especially poignant, in that David Denny had been largely impoverished by the financial panic of 1893. The Esther mine and Holden venture were two of his last remaining hopes of attaining financial security for himself and his family. The Esther Mine proved to be unprofitable; and at the time of David Denny's passing in 1903, he was only beginning to regain some degree of financial stability through other sources of income. The Holden Mine, as many NWHikers.net readers well know, is an entirely different matter. During its active years of operation, from 1938 to 1957, this mine produced 212 million pounds of copper, 40 million pounds of zinc, 2 million ounces of silver, and 600 thousand ounces of silver . . . . The gross value of these metals was $66 million" (N. Adams, "The Holden Mine," p. 73). James Holden, however, did not live to enjoy the profits of his mine. He died in debt in 1918, before the mine became commercially successful, and ownership of the mine subsequently passed to Holden's principal creditor. It was only during the Great Depression and Second World War, with the introduction of government subsidies for copper mining, that the Holden mine momentarily became a profitable producer of copper. The mine ceased operation in 1957, leaving a small ghost town (now a church-run summer camp) and several million tons of exposed mine tailings, which pose a potential threat to the water quality of Railroad Creek and Lake Chelan. Wow, nice of you to add that info Harry (If I may call you Harry )- looking forward to your updated Monte Cristo guide and the other history! Thank you for your kind words. Yes, you, and anyone else, are more than welcome to call me "Harry." Please also accept my belated thanks for your kind words of welcome to NWHikers.net last year. It will still be many years before the revised Monte Cristo guide, and the North Cascades mountaineering history appear. However, in the meantime, I hope to post a number of essays here on NWHikers.net, and thereby release some of the information ahead of time. I tend to be just a bit on the slow side in going about things. Last summer, I spent two days in re-surveying and mapping the Mt. Pilchuck Trail. In the time it took me to advance one mile up the trail, an 80-year-old grandmother passed me, made it to the summit, and passed me again on her way back down. We last met at the former upper pylon of the old ski lift terminal, at about 8:30 p.m., in the fading light of evening. She addressed me as "Young man," and she was concerned that I would not be able to make it to the top and return to the parking lot before dark. I assured her that I intended to turn around at that point, and finish surveying the following day. Heading back down the trail, she easily outdistanced me. As frequently is the case, I arrived back at the trailhead in the dark, using a flashlight, mine being the last vehicle in the parking lot. I suspect that what might, at first glance appear to be a "C", was actually originally an "L". The only other Lindsley known to have visited upper Gold Creek was Lawrie's father, Edward, who built the Ptarmigan Park cabin in 1896. The initial letter in the inscription, however, more closely resembles an "L" than an "E". Moreover, as evidenced by his photograph of Lemah Peak, Lawrie Lindsley is known to have ascended to the crest of the ridge above Ptarmigan Park at the head of Gold Creek. I do not have the original data pertaining to his visit readily at hand, but I suspect that this photograph was taken in 1899, which would be consistent with the date you observed in the rock. Lawrie also recalled seeing the send-off given to the Press Party in December 1889, when they departed from Seattle on their way to explore the Olympic Mountains. He did not recall witnessing their return to Seattle; but he did remember his disappointment (as an 11- or 12-year-old child) at not being able to see any fireworks display arise from the Olympic Mountains. The Press Party had been provided with an assortment of "fireworks," which they were to have set off from some mountain-top on a pre-designated day, to signal Seattle that they had reached the heart of the Olympic Mountains. Packing the fireworks up the Elwha Valley, however, proved to be too cumbersome, and this unessential baggage was soon jettisoned by the Press Party. Lawrie also recalled running into James Holden on one occasion on the trail up Railroad Creek, when Lawrie was headed to the Holden mine to take a series of photographs. The encounter was a tense moment for both individuals, particularly since Holden carried a rifle, and Lawrie was wearing a holster with a revolver. Holden felt especially intimidated by the situation, and soon distanced himself from Lawrie. Lawrie told me that he felt this to be a cowardly act because, at a distance, a man with a rifle has a distinct advantage over a man with a revolver. I relooked at the original photo taken of the rock and it does indeed identify clearly an L. Lindsley not a C. Lindsley. A grateful thanks to Harry Majors for his posts but also his foresight in interviewing Mr. Lindsley many years ago. After visiting the rock in question on Sunday I came back to read the rest of this thread that I remembered quite vaguely from a couple years ago. Somehow I had missed Harry's contributions, but am now very appreciative for his knowledge on the history of the area - very fascinating stuff! I've spent the last 30 minutes looking over several photos I took of the inscription and manipulating them on the computer. I've got the contrast, brightness, midtones, etc. set at a point where I can make out most if not all of the wording. Cool! Being able to visit the rock was certainly the highlight of this trip to Chikamin. I finally reached the inscribed rock last Friday (October 14), on my fourth try. The first two tries I had attempted as half-day trail runs, which was not a good strategy. The third, on Oct. 7th of this year, I made it more or less to the spot, but was foiled by weather: blizzarding slush and white out conditions with visibility of about fifty yards. I chose the wrong gully and ended up just north of the summit. 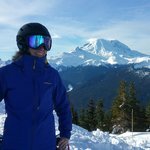 The following week, I approached via Mineral Creek instead of Snoqualmie Pass, and in pleasant weather had an easy time. I still chose the wrong gully-- point of fact, if you approach from the PCT west of the saddle, there is no right gully, but several will get you to the correct vicinity; scrambling from the east carries fewer difficulties. The inscription was very hard to read, which prompted me to search this site for more info. Thanks again to Harry Majors. Without his work, we could do little more than guess at the facts. Harry's post piqued my interest a little further. I already had a trip planned to UW Special Collections and decided to search for the Lindsley photos he mentions. I wasn't able to search through them systematically, as most of Lindsley's collection consists of unprinted glass negatives; these are in the process of being organized, with the plan of printing and digitizing the majority of them for eventual archiving in UW's on line database. I did get to pull two plates and give them a look. One of these, #3249 dated 1902, is of a cairn at the Chikamin summit. Two details stand out: one, a small rock inscribed with Lindsley's name, smaller but otherwise identical in style to that on the Denny/Lindsley inscription. Two, a small triangular rock inscribed "USGS". Lindsley's notation on the plate envelope says "Crew at cabin watched me climb with telescope." A member of summitpost.com has posted that while on Chikamin's summit in 1990, she found the above mentioned USGS rock. She did not mention seeing a rock with Lindsley's name, but it may still be up there as well: I think the summit is broad and flat enough that a rock right on top would not roll off quickly. I need to take yet another trip there, this time to the summit, to look around-- though I will probably wait until spring. Compare this image from the UW Digital Collection with the one that Admin Tom posted one page back. Handwritten on negative jacket: Sept 1913. Gold Creek Series. 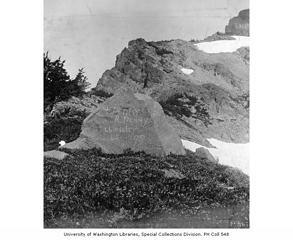 Rock in goat pasture with names cut in July-Aug, 1899. V. Denny, R. Denny, L. Denny Lindsley. Thos Denny, 1904. Great find Lopper! This will go nicely with one of my own recent photos of the rock. I was going through photos in our family collection and came across a photograph bY L. D. Lindsey #3307 of the inscription on the rock above the Esther Mine. An internet search brought me to this site and this thread on the inscription, which has been very interesting. The belief in our family has been that the R Denny on the rock is Roy Denny, my grandfather, a cousin of David Denny. I followed up on the Linsley photo collection mentioned above at the UW Library. I put my grandather's name in the search box (Roy Denny) and it came up with several photos of my grandfather at the mine. And all this time I thought he was goldmining in Alaska.